After their Scottish Cup exploits last weekend The Dons return to League action with the visit of St Mirren at Pittodrie. It will be the fourth meeting of the season between the sides and with both at opposite ends of the table every point is crucial to achieve their respected goals. The hosts currently lie in 3rd place in the Premiership and are five points off Rangers after the defeat last Wednesday and are locked on 46 points with Kilmarnock. “ I do feel that certainly the game on Sunday against Queen of the South we took too long to get going in bringing that drive. There was nothing wrong with the performance but it was just a bit safe. For me we’ve got to try impose ourselves on the game. With so few league games left until the end of the season the importance of each and every three points is clear. Hopefully we can see that in the performance. “We’re in the Quarter-Final of the cup and have a home tie to look forward to. We’ve got important league games coming up, none more so than tomorrow so we need to make the next game important by winning games. That is the only way forward for us. If we can keep winning the next game becomes more relevant and more crucial in terms of what we want to try and do. That’s the way I want it at Aberdeen, and I don’t want to just play out a season. I’ve always said that and I want the end of the season to be meaningful and have something to really play for. “We’ve done our homework on St Mirren. With the recent influx of new players and not that many games having being played since their overhaul, it’s pretty hard to get an understanding on what they are. We’ll go into it the same as any other game and that’s getting three points. It’s been a difficult season for The Buddies after their return to the top-flight in the summer. They began the season with new manager Allan Stubbs in charge, however the former Hibs boss left the club in September and was replaced by Northern Irishman Oran Kearney. In January Kearney took 14 new faces to Paisley, but for the time being the remain bottom of the table in a three team battle to avoid the drop alongside Hamilton Accies and Dundee. After facing The Dons, St Mirren take on Hearts at Tynecastle before back to back home matches against Livingston and Kilmarnock. There have been three clashes between the teams so far this season and it’s The Dons who have come out on top on each occasion. Back in August the teams were paired together in the Betfred Cup Second Round after Saints made it through their group whereas The Dons entered the competition at the knockout stage after competing in Europe. 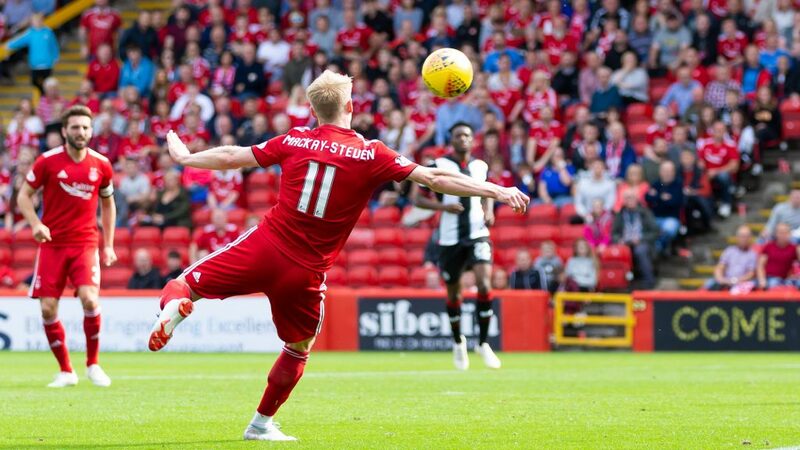 Gary Mackay-Steven got Aberdeen off to the perfect start after 15 minutes with an excellent volley at the back post. Captain Graeme Shinnie doubled the advantage five minutes later from close range and the tie was effectively killed off soon after when Scott Wright raced in on goal and unselfishly cut back to the unmarked Stevie May, who made no mistake from 10 yards out. GMS was a man on fire at the start of the season and slotted home from the spot after the break to ease The Dons through to the next round. The first league meeting took place at the beginning of October and produced a similar scoreline in favour of Aberdeen. Sam Cosgrove, who was still longing for his first goal in a red shirt popped up with two that afternoon as the Red Army were introduced to Connor McLennan. The AFC graduate scored an excellent curling effort on his first start not long after Cosgrove broke the deadlock and it was three before the break as Max Lowe popped up in the box to coolly slot home. Cosgrove grabbed his second with a header in the second period, but St Mirren did get a late consolation through Jackson. The teams met just before Christmas in a match that proved to be a much tighter affair down in Paisley. The Dons took the lead midway through the first half when Stevie May calmly dispatched a penalty although the lead didn’t last long as the hosts equalised with MacPherson slamming home from close range after a free kick dropped to his feet. On the hour mark Cosgrove popped up with what proved to be the winner after Considine’s header crashed off the crossbar and the number 16 nodded home the rebound. Take a look at the sneak preview of Saturday’s RedMatchday magazine as we speak to Michael Devlin and Tomas Cerny and take a look back at the U14s trip to Manchester United as well as much more. If you can’t make the match make sure to tune into our RedTV coverage. At 2.45 the team will be on the air for UK subscribers and we’ll have live video for International Subscribers. Post-match we’ll have reaction, highlights, goal action and a full match replay. 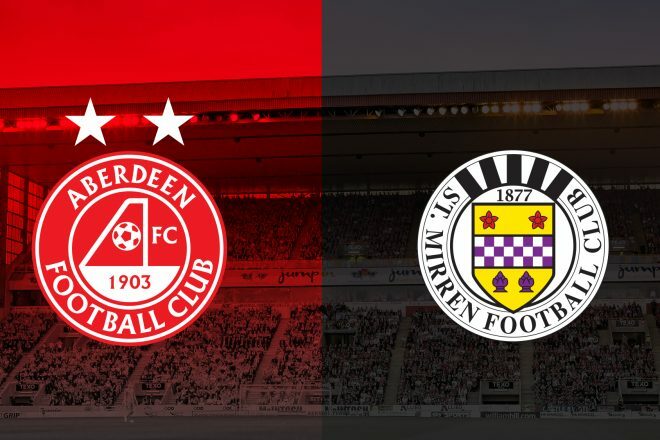 Aberdeen came from behind twice to share a point with struggling St Mirren. Ferguson and Cosgrove scored either side of half time to cancel out a first half penalty and a second half strike from Kyle McAllister on what was a frustrating afternoon for The Dons. To make matters worse Tommie Hoban went off towards the end of the first half after sustaining what looked like a serious knee injury. 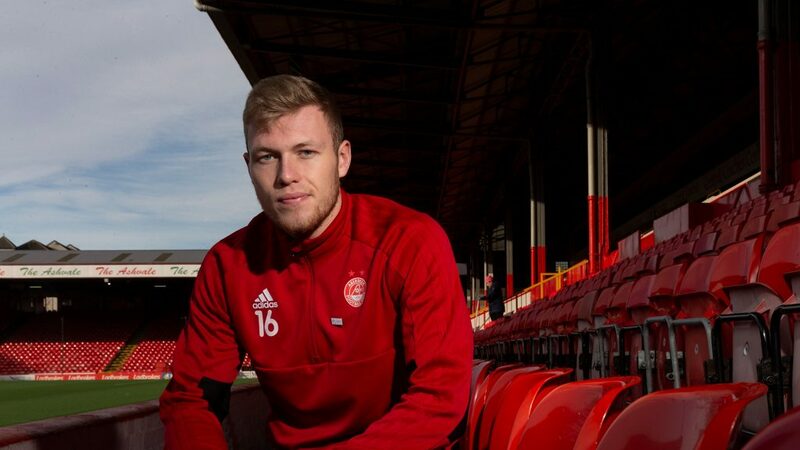 Michael Devlin returned to the Aberdeen starting eleven for the first time in three months, partnering Andrew Considine at centre half. Shay Logan missed out through injury and Stevie May dropped to the bench in place of last week’s super-sub Niall McGinn who earned himself a start after setting up two and scoring one in the 4-1 Scottish Cup victory over Queen of the South. Returning to league duty, the stakes were high for both teams, but for very different reasons. Prior to kick off The Dons sat third, level with Kilmarnock and five points behind Rangers. At the other end, The Buddies were in desperate need of points – sitting rock bottom and three points adrift of safety. The visitors started well, winning a couple of early corners which The Dons dealt with comfortably. McGinn, Ferguson and Cosgrove all had early sniffs at goal in the opening ten minutes but none of them tested St Mirren goalkeeper Václav Hladký. Tommie Hoban looked lively down the right-hand-side and did well to fizz a ball across to Ferguson who took it down and got a shot away at goal which was deflected out for a corner. Moments later McGinn was causing trouble on the same flank, putting in an inviting cross which only needed a touch from Cosgrove to open the scoring. The Dons continued to press in a search for the opening goal. Brad Lyons was the first player of the afternoon to go into the book for taking out GMS in the final third. But it was the visitors who drew first blood in the tie. Good work down the right from Nazon won a corner on the counter attack for St Mirren. From the resulting set-piece Sam Cosgrove was penalised for pulling down Brad Lyons in the penalty area and referee Craig Thomson showed no hesitation in pointing to the spot. Nazon made no mistake from 12 yards, his penalty clipping the post on the way in past Lewis to give The Buddies the lead. The Dons responded well, creating a few chances of their own. Greg Stewart had an opening after latching onto a pass from Cosgrove. Hladký was out quick though and cut down the angle well to deny Stewart the equaliser. 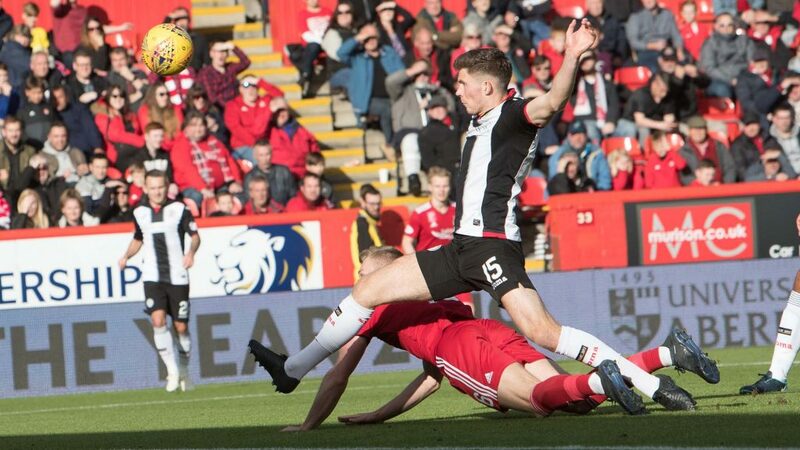 Just after the half-hour mark The Dons levelled through Lewis Ferguson. St Mirren defender Jack Baird nearly stuck it into his own his own net but it fell on the favourable side of the post to spare his blushes. The resulting corner was taken short, GMS to McGinn who whipped in a perfect ball onto Devlin who flicked it to Ferguson who headed in from 5 yards out at the back post. The Dons should have had the lead minutes later. Cosgrove flicked on a long ball over the top to Stewart. 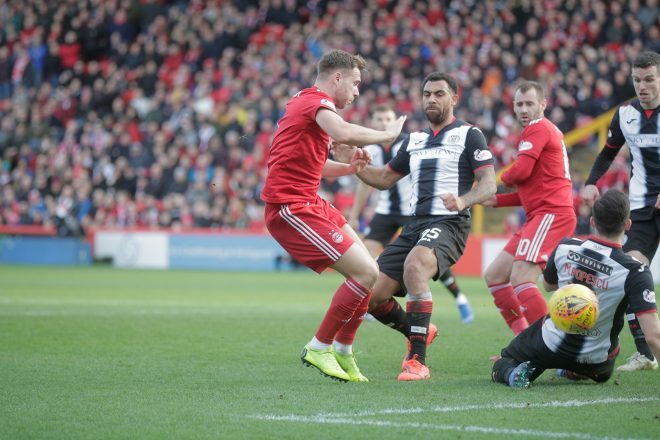 It was 2 on 1 and Stewart unselfishly picked out Niall McGinn who with the goal at his mercy, clipped it over from 10 yards – a major let off for St Mirren. Just before the break Tommie Hoban went down clutching his knee after changing direction unchallenged. The defender immediately looked to be in a lot of pain and it looked serious. The physios and medical team were on immediately and after a five minute stoppage in play Hoban was stretchered off and replaced by Stephen Gleeson. Eight minutes of time were added on at the end of a frantic first half. GMS continued to look threatening down the right hand side, covering a lot of ground and beating his opposite number on numerous occasions but The Dons didn’t threaten after Hoban’s injury and the sides went in level at the break. Both teams came out for the second half with St Mirren making two changes – goalscorer Nazon and Muzek off for Jackson and Erhahon. The visitors nearly regained the lead moments after the game restarted via the head of Brad Lyons. The Buddies looked dangerous on the counter and they worked it well to Lyons, who probably should’ve done better with his free header. A real let off for Aberdeen. Considine and Ferguson both had efforts on the St Mirren goal in response but neither could trouble Hladký. 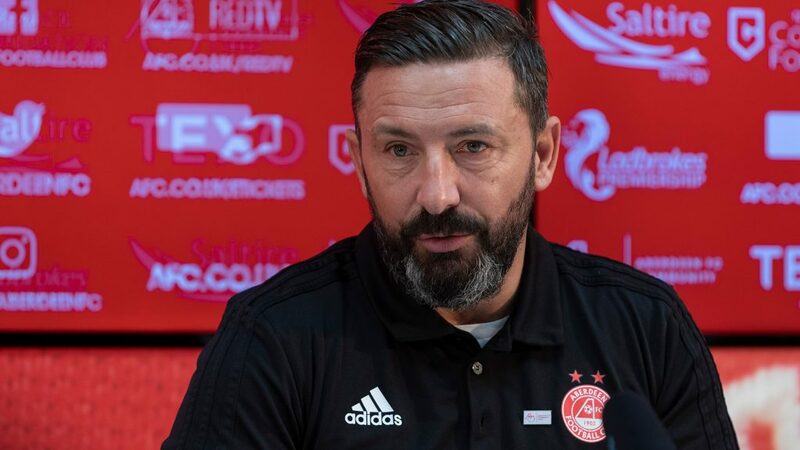 The Buddies were holding firm and looked to slow the game down at every occasion and make it as scrappy as possible not allowing Aberdeen to play their free-flowing game. St Mirren were forced into making their final change after Anton Ferdinand was forced off due to injury, former Don Greg Tansey came on to replace him. St Mirren defended patiently and they took their chance after Mikey Devlin lost possession in the middle of the park with a stray pass. The Buddies pounced and worked the ball out to Kyle McAllister. The winger cut inside and as Considine slipped at the vital moment, McAllister fired home past Lewis to give the visitors the lead. McInnes responded immediately by throwing another striker into the mix with James Wilson coming on for Max Lowe. The Dons huffed and puffed but were struggling to create any clear cut opportunities. Jackson nearly doubled the visitors advantage on the break again. The striker got in behind and flashed his shot across the goal and inches wide. The Dons began to up the ante after a Greg Stewart shot from distance lifted the crowd. His shot was tipped round the post, although it looked as if it may have been going wide. Wilson had a sight of goal which was again blocked at the final moment and Greg Stewart grazed the post before GMS passed up a great opportunity blazing a volley over from 12 yards from a corner. The pressure eventually paid off and with 15 minutes left to play The Dons levelled it through Sam Cosgrove. Graeme Shinnie took his time out on the left wing and picked out Cosgrove who smartly converted with a first-time volley. All square with just over 10 minutes to go and McInnes made his final change of the afternoon, McLennan on for McGinn. Moments later The Dons missed a golden opportunity to take the lead. This time it was Greg Stewart who picked out Sam Cosgrove who got up well but he couldn’t direct his header on target. All of a sudden if there was going to be another goal in this one it was bound to be for the home side. St Mirren were forced to play out the remaining four minutes of additional time with 10 men after McAllister limped off injured. The home side threw everything at the visitors in the final few moments but unfortunately they couldn’t make the extra man count and had to settle for a share of the spoils.